Silver linings? #Packers offense should be really good next season after they re-sign TE Jared Cook. #Packers add another touchdown on a pass to Cook, but the 2-point conversion fails. Falcons lead, 44-21, with 6:43 remaining. 2-point conversion is no good. Matt Ryan is taking snaps on the sideline. I have no idea why. #Packers RT Bryan Bulaga is now walking to the locker room. That's three injured starters on the offensive line. And now RT Bryan Bulaga is headed to the locker room. Bulaga's injury is a possible concussion. #Packers OT Bryan Bulaga being evaluated for possible concussion. If the #Packers get the ball back, they only have four offensive linemen who can play. Letroy Guion is about to play offensive line for #Packers . With all the injuries on OL, Guion in at guard now. Lang, Bulaga and Taylor out. In comes Brett Hundley for the Packers. Aaron Rodgers' season is over. DT Letroy Guion is playing guard for the #Packers . They're out of O-linemen. Brett Hundley in at QB. And Brett Hundley is at quarterback. With Bryan Bulaga, T.J. Lang and Lane Taylor out, NT Letroy Guion is in at right guard. #Packers have lost 60 percent of their offensive line today. So Letroy Guion is playing right guard. That's called "depleted" by injuries. Poor Brett Hundley. He has two starting linemen -- Bakahtiari and Linsley -- to protect him. I say audible to a handoff. Guion with a great block! Reality setting in for Falcons during this 2-minute warning. They're going to the Super Bowl. 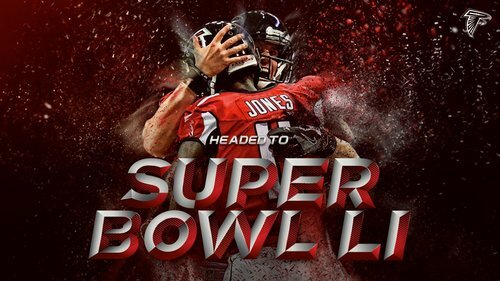 Your Atlanta Falcons are Super Bowl bound! It was a remarkable run (the table) for the #Packers , but for the second time in three seasons they fall 60 minutes short of the Super Bowl. The #Packers ' run ends in the NFC Championship Game. 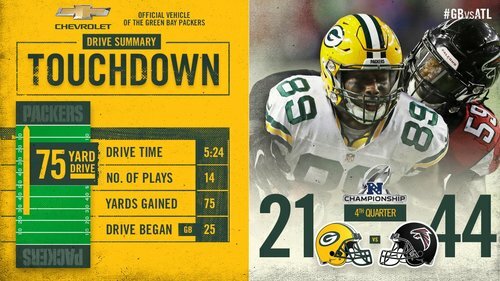 The #Packers have now reached the NFC Championship Game four times in 11 seasons under coach Mike McCarthy but are 1-3 in those games. #Packers have gone 10-7 in the playoffs with Aaron Rodgers at quarterback, reaching one Super Bowl and three NFC title games. #Packers D has been on verge of collapse for awhile. Finally happened today. Sam Shields at the game. Said he's still having concussion symptoms but feels much better. Said he hasn't given up on playing.